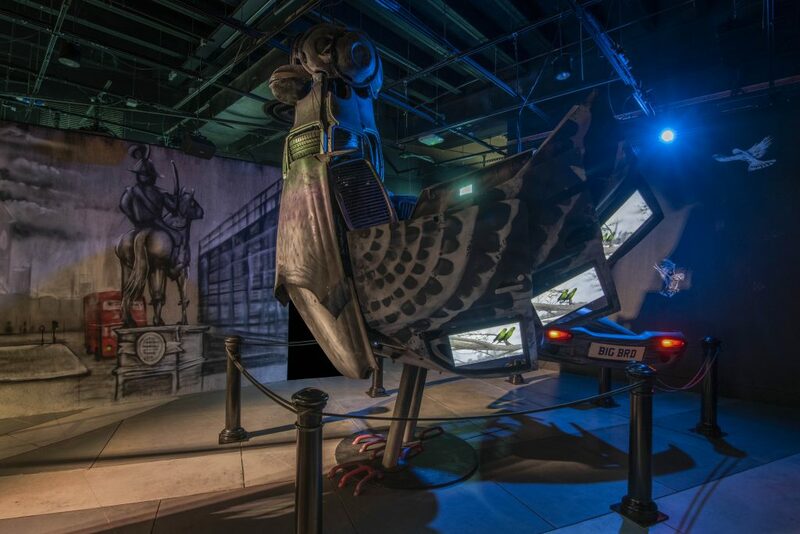 Beasts of London is the first-ever fully immersive experience at the Museum of London. 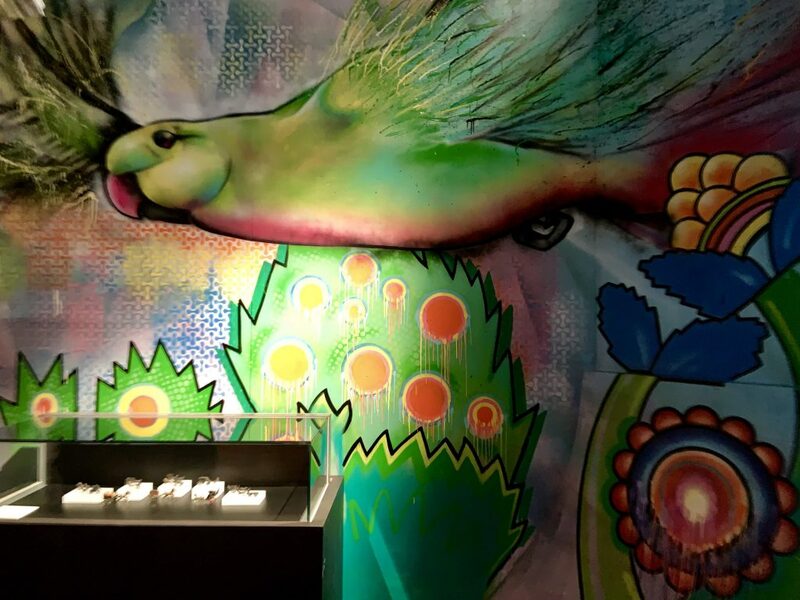 It is an ‘experience’ rather than an exhibition. 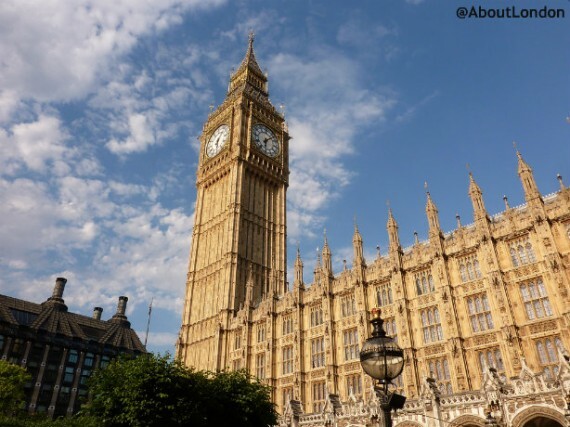 This particular experience has been created with families in mind, highlighting key moments in London’s history that are taught in school. 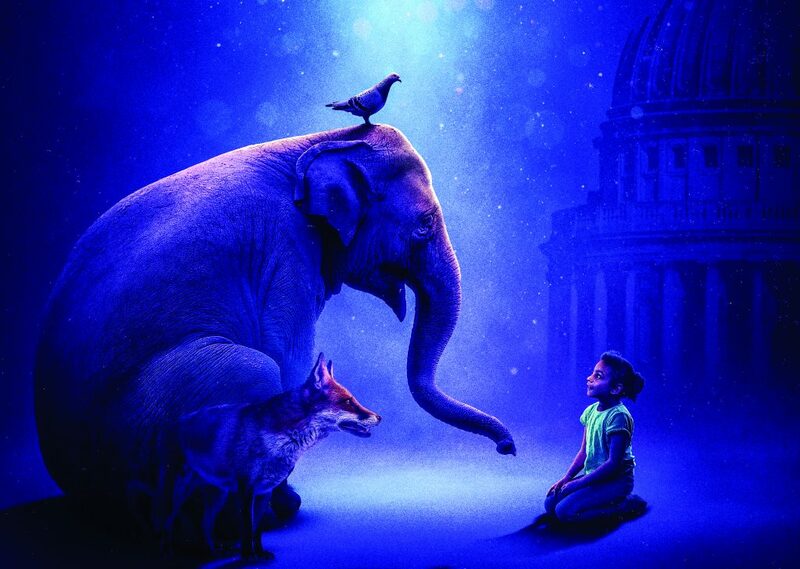 It is the story of the animals that have helped create London. Created in partnership with the Guildhall School of Music and Drama, the animals (the ‘beasts’) have been given voices. You will hear from horses, a polar bear, sheep, an elephant, eagle and more. You get to enter in groups of up to 12 people. Each ‘episode’ lasts for 7.5 minutes, including walking between, so the total running time is about 1 hour 10 minutes. 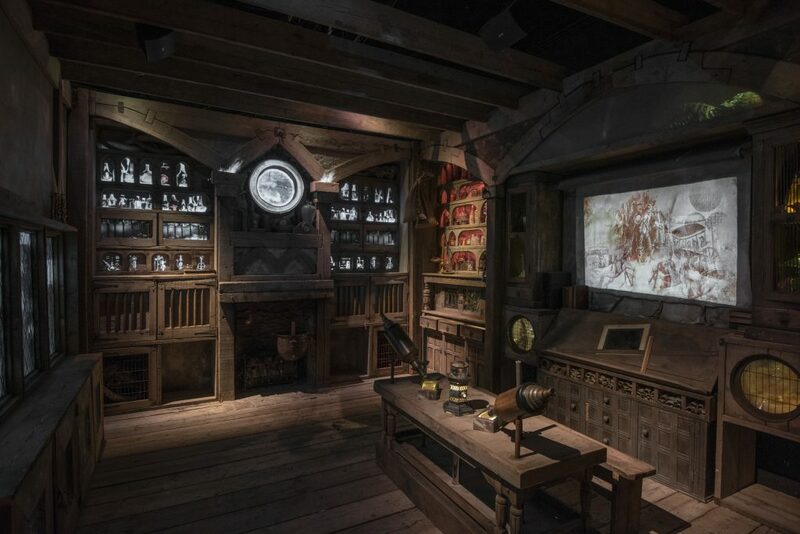 Unlike attractions such as The London Dungeon, you enter with your ‘group’ but there’s nothing stopping you staying to hear an episode again or seeing things in a different order. 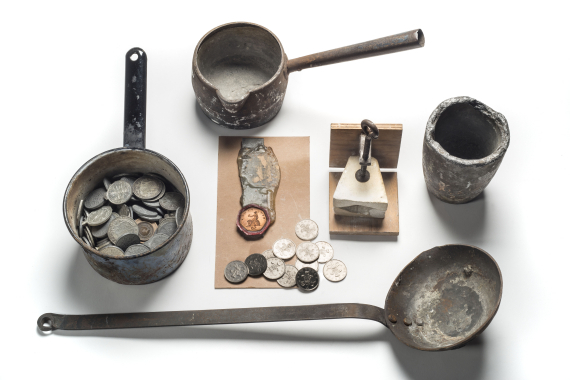 There are nine rooms (episodes in the broadly chronological story) that are inspired by objects in the museum’s collection. The story begins before London was London and there’s a part of a mammoth’s jaw on display. The audio-visual got my back up a bit as it was all “we’ve been here longer than you” which is an offensive argument used by some Londoners to new arrivals. But once I was reminded we have opposable thumbs I got over that concern. For the next episode the intro tells us “long after the hippos, bears and sabre-toothed tigers died out, a new beast arrived: the Roman Army”. If you’ve been to the Museum of London before you may well have seen the first gallery on the ground floor that explains that these animals lived on the site of London a long, long time ago but I felt there was quite an unexplained leap to presume everyone knew that. The Roman section is more about Romans in general and not just in London. 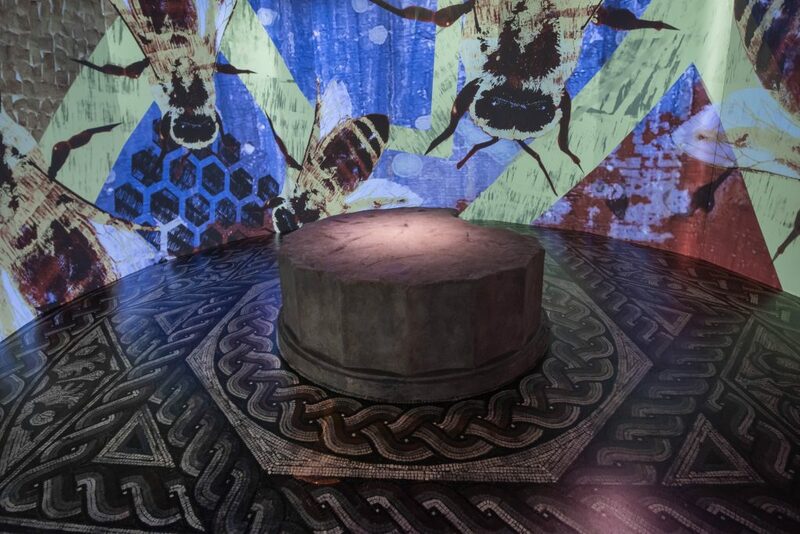 As we have the remains of a Roman Amphitheatre in London close to the museum (and it gets mentioned in the written intro) it was surprising not to include more about battling gladiators in the audio-visual display. Here, squeaky-voiced Joe Pasquale plays the Dormouse opposite Pam Ferris as the Eagle. Seating has been added in half of the rooms so you can rest along the way. Here’s a snippet of the type of story you’ll hear. 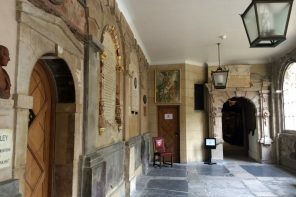 The rooms are off either side of a wide corridor with the impression of curving whales bones overhead. There’s also plenty of animal street art. Episode 3 is about medieval times when the Royal Menagerie was kept at the Tower of London. We saw elephants, zebras, sheep and baboons projected. And we heard that elephants were given wine to drink! 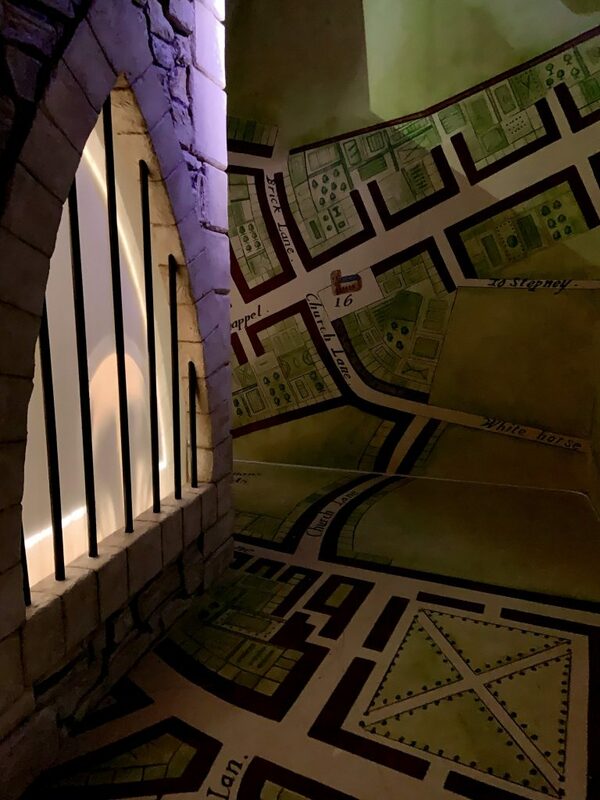 The floor and walls are covered with old street maps so you can trace those while listening to the animals. The “Caaw!” of the Tower’s ravens was used for “Cor, blimey!” which is one of my favourite London exclamations. This room-set made me think of escape room games and I wanted to dash around to find the clues. 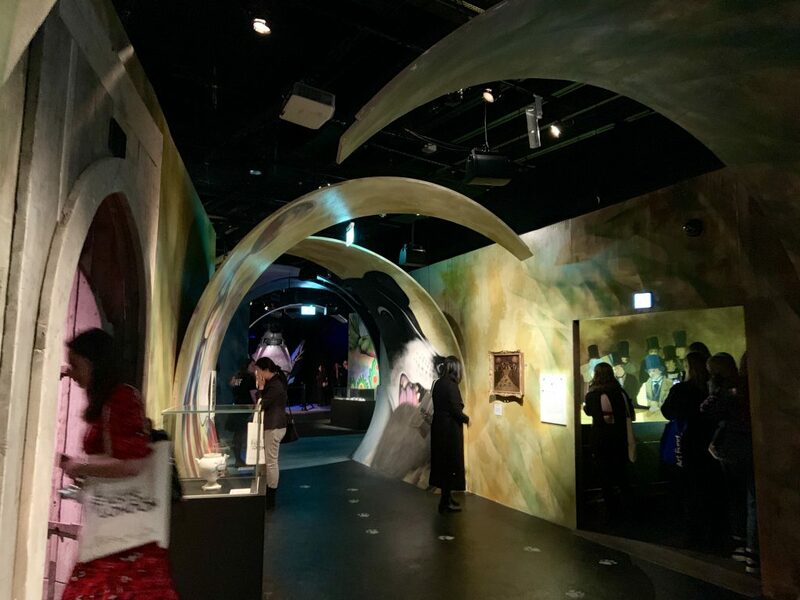 Do make sure you go right inside the rooms as sometimes it was hard to hear over the other audios happening nearby as the rooms are only screened off and do not have doors (or a ceiling). Next is animal fighting in a rowdy London tavern where a Manchester Terrier called Tiny the Wonder Dog tells us he could kill hundreds of rats every week. Angellica Bell voices one of the rats that was used for this entertainment. 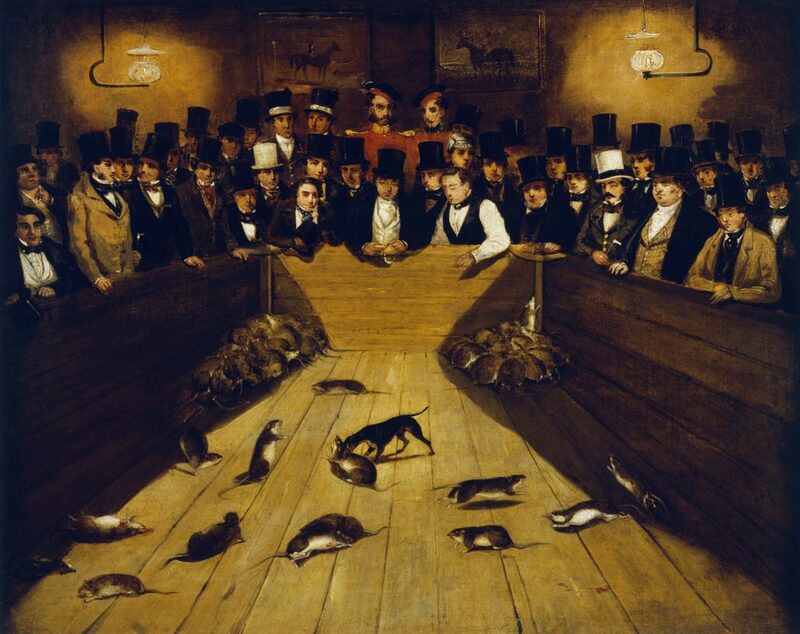 While blood sports such as animal baiting between bears and dogs or tigers against dogs were banned in 1835, baiting of rats was still allowed. Episode 6 is about the circus. 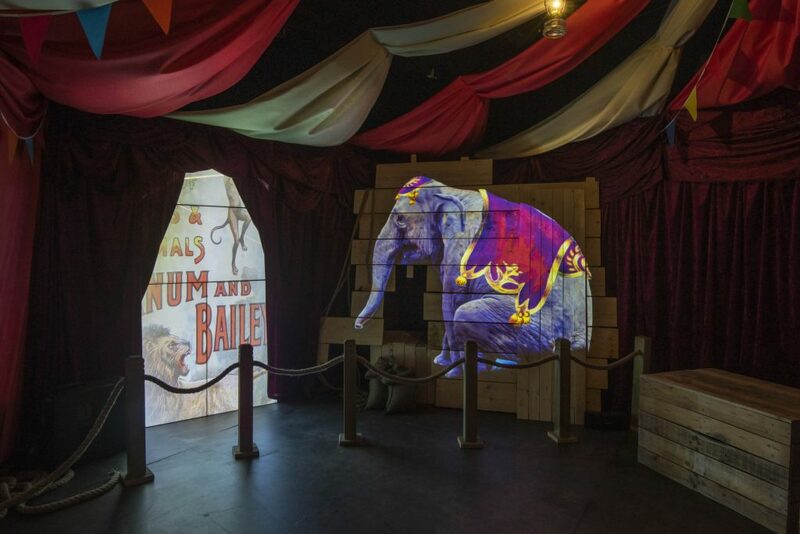 I was most surprised to read about an elephant called Jumbo that became unpredictable so the Zoo sold him to PT Barnum’s circus (The Greatest Show on Earth). 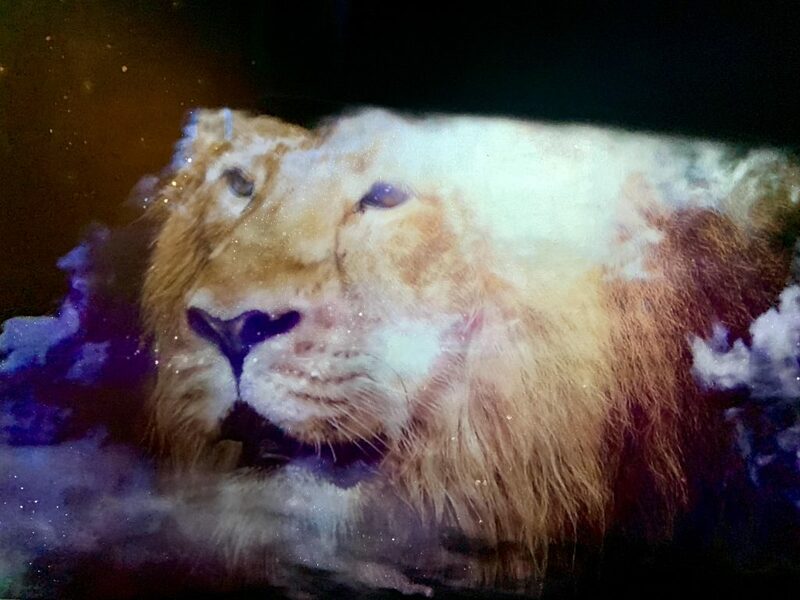 The audio did focus on animal cruelty as “a broken beast will never seek escape”. 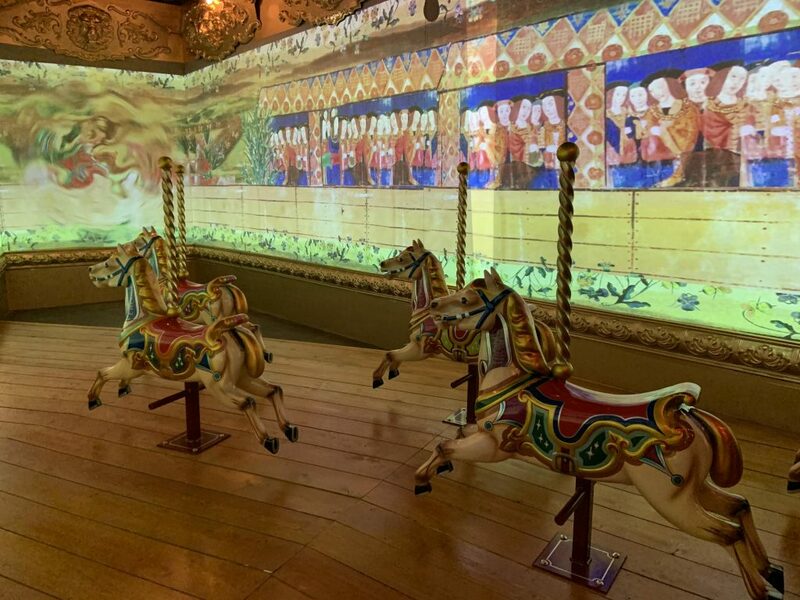 Episode 7 is a marvellous room where you can sit on a carousel horse or in carriages as you hear about the horses that have made a difference to the city. The visuals do not include the horses so you need to listen carefully to discover their stories. This might be more challenging when the room is full of children excited to sit on the static fairground ride. Stephen Mangan voices Governatore, the steed to King Henry VIII. And Nish Kumar plays Thomas the horse who represents the military horses of London. It’s quite dark inside which is understandable for the projections. But this was frustrating near the enormous pigeon made of taxis as you couldn’t really see it clearly. And a yellow TAXI light would have made it more obvious to me it was made of taxi parts. It really is quite stunning so it would be great to raise the lighting here. 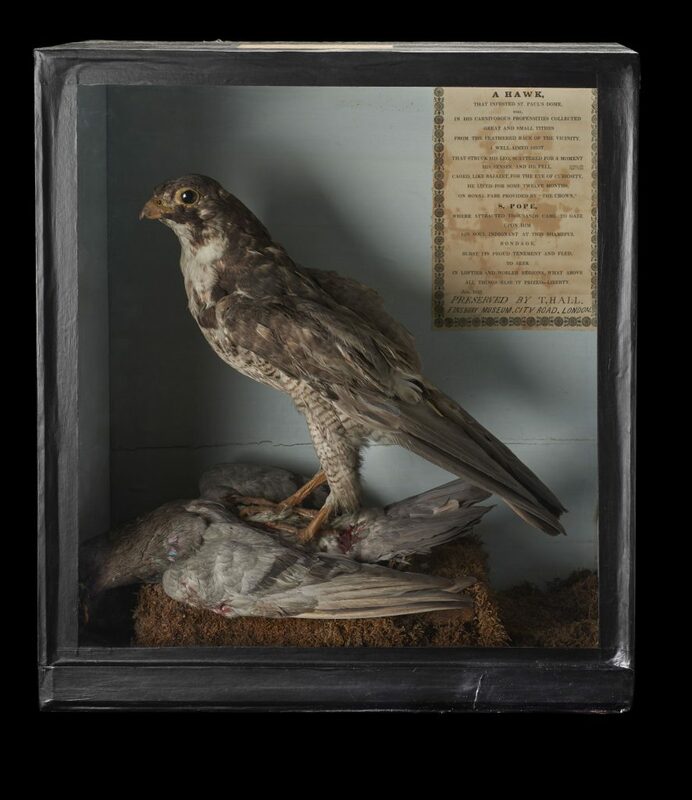 There is a stuffed peregrine falcon in this section (mounted on top of a pigeon) that lived in and around the dome of St Paul’s Cathedral in 1834. The final Episode has Kate Moss voicing the fox. There’s a stuffed pet cat and painted pigeon poop on the floor. This all goes to prove, London is not a “concrete desert” as there is a multitude of animals in London today. And they are not all in London Zoo. As Beasts of London is aimed at families I wonder if the length of each audio-visual might be too long for short attention spans. And the short captions on the collection objects could have been enhanced with illustrations (find the zebra could have been a picture of a zebra). But it’s not just for the kids as a lot of the information is aimed at the older audience so hopefully all ages will enjoy a visit. 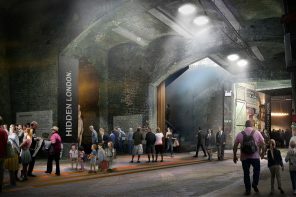 It’s great to see the Museum of London trying something new and I reckon this will be a hit. Tickets: Family tickets are from £20. Adult tickets are from £9. There’s variable pricing depending on the day or time of your planned visit. 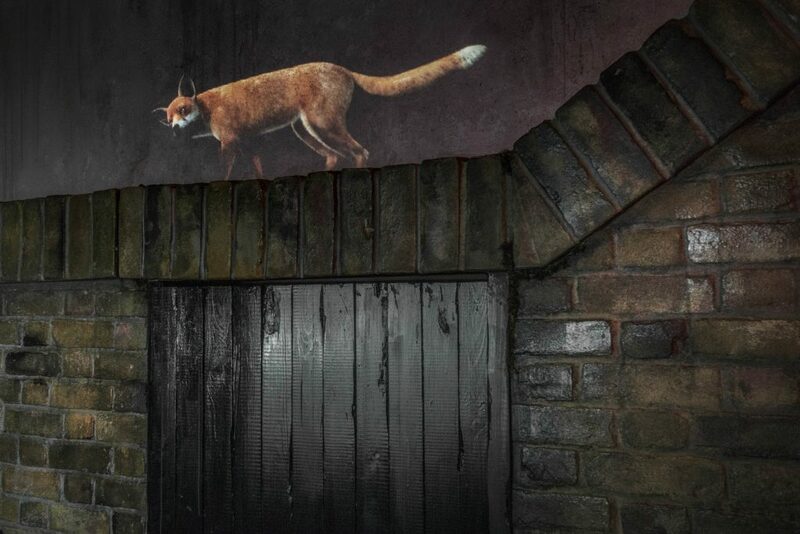 There are lots of family activities planned including a Beasts of London Family Festival on 25 and 26 May 2019. The adult programme includes drawing and taxidermy classes. This London on Wheels Routemaster bus tour appeals to me the most.